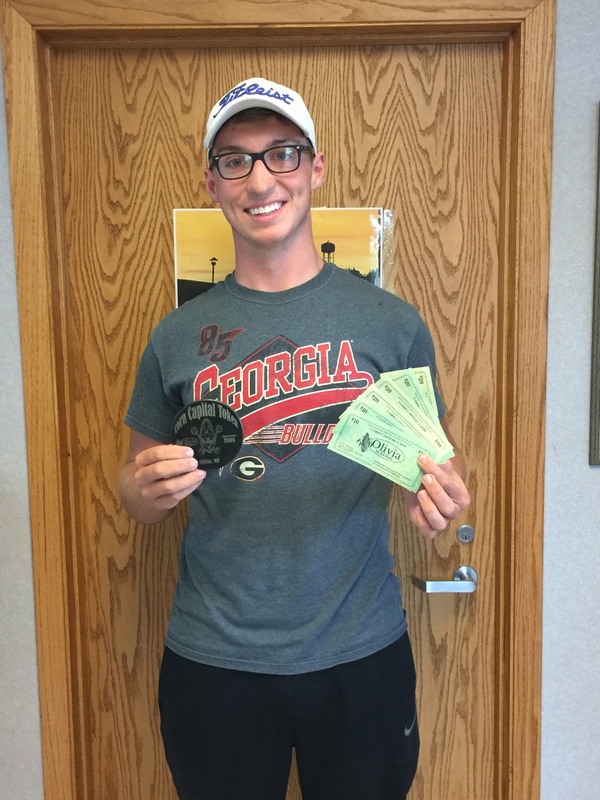 Congratulations to Jack Ryan who found the 2018 Corn Medallion! It was found on Wednesday, July 25, 2018 in Kubesh Park near the Horshoes posts. Jack is from Olivia and is college age. Congrats Jack! Enjoy your $100 Corn Capital cash! The Olivia Chamber of Commerce and Cornelius say we can now order Corn Capital Days T-shirts ONLINE! 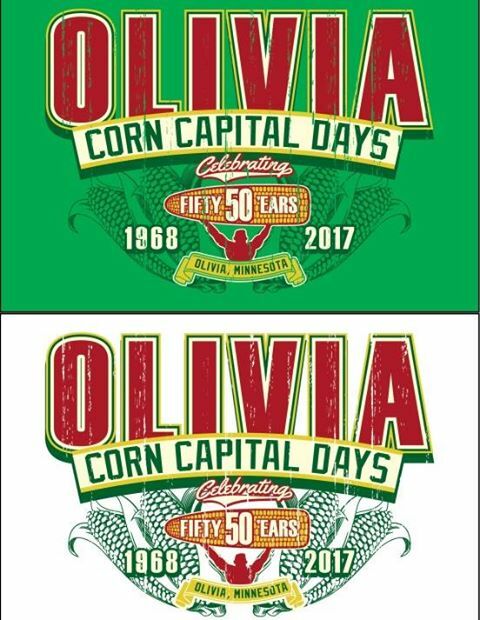 The 50th Anniversary of Corn Capital Days is just around the corner and you can pre-order your 50th Anniversary Commemorative Corn Capital Days T-shirts online this year! Shirts are available in TRUE Olivia Colors—- Kelly Green and White! Click this LINK to order online. * We are adding a “HOME SHIP” option sometime today, so you can have shirts directly shipped to you! Cost – $15 per shirt- in any size!… plus shipping if you want it delivered to your home or no shipping fee if delivered to the Chamber office with a pick up date/delivery in late June. We only have a limited amount of the shirts this year… so get yours ASAP! Page Snyder Drug– A limited number of shirts will be available at Page Snyder Drug starting June 5th-25th, 2017. Cost is $15 per shirt. Corn Capital Crazy Days– downtown Olivia on July 28th from 9am-1pm at DOWLING PARK- just south of Dirk’s Furniture on Main Street! Make sure you have a shirt, Order Now! It’s hard to believe that another Corn Capital Days is just around the corner! Whether you live in the Olivia area, or come back to Olivia just to experience Corn Capital Days, there is fun to be had for all! See complete schedule here. For Kids & Families: Check out our event schedule to see the events we have lined up for kids, such as the RCAC triathlon, Family Fun Night & Kiddie Carnival (Tug-of-War, Spraying Fire Hose, Petting Zoo, Inflatables, and more! ), Kid’s Fair at United Methodist Church, Youth (and adult) Bean Bag Tournament, Zoomobile, Kiddie Parade, Pedal Pull, and more! Of course, the Grand Parade and the Corn Token Hunt are fun for all! For Music Lovers: This year’s Corn Capital Days is full of music and entertainment! The Dam Jammers are returning for our Friday night downtown street dance. New, this year, we will also have live music downtown at Dowling Park on Friday from 11am-1pm. There will also be live music at Max’s Grill, and Brly’s Den. Saturday in the park, the Blue Ox Jazz Babies and Summerlin Groove will be performing as well! For Sports Lovers: Stay active during Corn Capital Days with golf tournaments, volleyball tournament, and the Health Choice Run. Kids can also participate in the Health Choice Run, the Triathlon, and the Bean Bag Tourney. Also, don’t forget about the Corn-Olympics! Hungry? By popular demand, we will have food options downtown on Friday from 11am-1pm this year. You can also enjoy Grilled Pork Chops, Nachos, and a Bloody Mary Bar at the Legion at various times. Food vendors will also be set up during the downtown street dance on Friday night. Ice cream socials, root beer floats, and bake sales will satisfy your need for treats. There are various food options at Nester Park on Saturday, and Of course, you can’t miss the Corn and Bean Feed! The Lion’s Fly-In Breakfast at the Olivia Airport is a great way to top off your weekend. Want to Shop? There are plenty of opportunities to shop during Corn Capital Days, starting with the used book sale at the Olivia Public Library. Our local downtown merchants will have their Crazy Days Sales on Friday from 8am-2pm. There will also be vendors set up on Nester Park on Saturday. 2016 will be another great year of Corn Capital Days celebrations. We hope to see your family in Olivia, Minnesota – the Corn Capital – during the last weekend in July! Please be sure to take a look at our schedule complete schedule for more details and changes! See the Complete Schedule Here. Register here for a unit in the Corn Capital Day GRAND PARADE! Please be mindful of your spacing during the procession of parade to avoid large breaks between units. Each unit is responsible for its own mode of transportation in the parade. If your unit includes animals, you must provide your own waste disposal. If your unit chooses to toss candy/items during the parade, you will be solely responsible for any injuries occurred. Notifications will be sent the Week Of the parade. We will send notifications via email to those who registered via the online form unless mail or phone preference is specified. 2.) Please write checks to the order of : Corn Capital Days, Inc. Mail check to Nancy Mathison. Fee for Commercial Units – $50.00 and Non-Profit/Political Units – $25.00. Please reference your organization name on the check. Gearing up for Corn Capital Days 2015! The Corn Capital Days Committee has been hard at work putting together another fantastic event for 2015. The schedule is loaded with fun for all ages! We are still looking for some volunteers for events like our Corn Feed! Please fill out this simple form or call the City office at 523-2361 to be matched up with a volunteer need. You can take a look at the online event schedule here. You can also click on the schedule below if you wish to print it as a PDF and take it with you. The schedule for Corn Capital Days 2015 is now live on our website! You can check it out here. Any many other annual favorites! With all the great events we have planned, Corn Capital Days will begin on Monday this year, instead of Frida for a week full of celebration! Be sure to visit the Corn Capital on July 20-26, 2015! 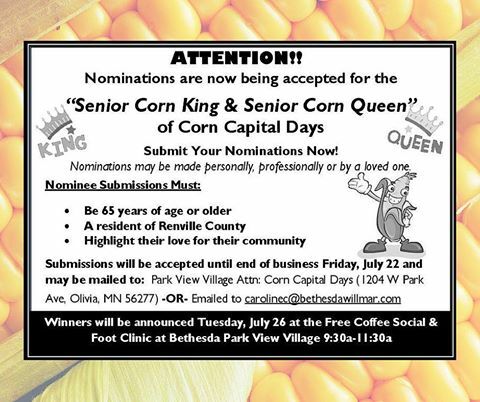 The Corn Capital Days Board is seeking nominations for a Grand Marshal -or a couple to serve as Grand Marshal, Corn King and Corn Queen, and Lifetime Service Award for the Corn Capital Days Parade Festivities. Citizens are encouraged to write a nomination letter suggesting a person or couple to receive these honors. If you know of someone you would like to see honored this way, please submit their names, address and phone number and include a brief summary of that individual’s or couple’s contribution to the City of Olivia. Nominations must be submitted by March 1st, 2015 to Susie Lothert 1009 W Lincoln Ave Olivia MN 56277. Help us Plan Corn Capital Days 2015! We are having monthly meetings to plan the next Corn Capital Days, which will be July 22-26, 2015! Our next meeting is Monday, November 3rd, Noon at the Pizza Zone in Olivia. We would love to see some new faces there and get your ideas! Nominations for the 2015 Executive Board will be discussed at this meeting. Voting at the December 1st meeting for officers. PLEASE Attend this meeting if you have a nomination or encourage individuals that wish to become more active with Corn Capital days to attend the 11/3/2014 meeting. Also, we have added a list of the 2014 CCD Sponsors to our website. We would like to extend our gratitude to all of the Corn Capital Days Sponsors! 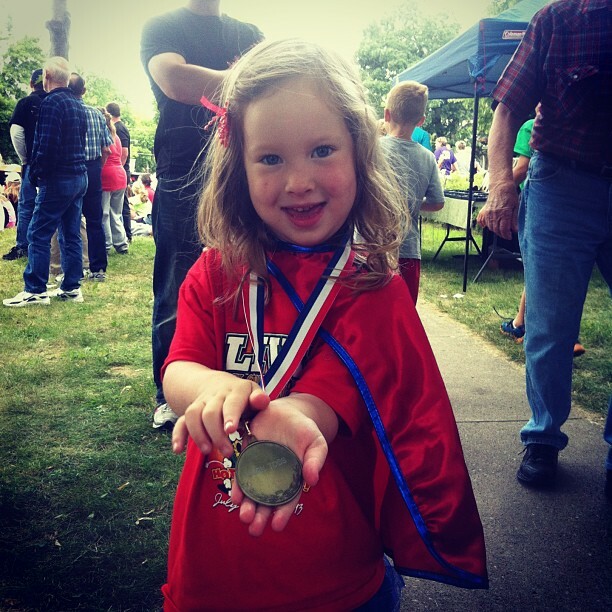 First place winners received their medals at the Pedal Pull Event. Medals for 2nd and 3rd place are available for pickup at the City Office, M-F, 8-4:30 daily. Congratulations to all the kids who participated!